“Whatever party promotes the most strident pro-gay agenda, even if based on deception (and even if the rest of their platform is destructive in every other way) will be transformed into the Holy Grail of LGBT victory. And by extension, THE liberating force for all other oppressed peoples across the globe. No one is required to vote for this party, or in any other way promote it, to make this happen. It’s a done deal no matter what. “There is every benevolent reason to finally put to an end, once and for all, this persecution of sexual minorites that has gone on for many centuries, perpetrated by this or that group, whether religious or not. It is to the shame of any political party that claims to support gayfolke, to nonetheless continue to drag its feet on the matter of homophobia and its consequential terrorism. As if 100% strident alliance of LGBT’s were such a difficult thing to do. Which it is not. “For it should be obvious to all intelligent humans at this point, that this election fiasco is totally scripted, like “Idiocracy” or some other dystopian, grade B movie. Certainly not without comical interludes that will increase in vigor and duration as the weeks pass. And as they do pass, more and more people shall wake up to the likelihood that this is a script contrived for the enlightenment of your species…and, of course, for our own selfish amusement. “Please, you who read this, do not feel upset if you do not grasp the message, or do not believe it. But I promise: the truth of what we claim through Mr. Krahlin’s keyboard will make itself increasingly evident between now and November 4th, by which time everyone on this planet will be awakened to this glorious dupe. P.S. : “The Purge 3” (its alternate title) was released on my birthday, of all days: July 1st. I only came to realize that after composing the above message. Forget for a moment, the hilarious manner in which My Glorious Gay Angels have conveyed such a revelation, and see for yourself what I mean. Click on the video link below, then listen to what he says for the next twenty seconds. Gingrich’s speech is a WINNING STRATEGY to beat the Democrats this November. But IT IS A TRICK, and a very clever one at that. For the GOP is obviously picking up issues that our party is either neglecting, or on which they’re dragging their feet. And NO OTHER TOPIC is as timely and of such great import, than LGBT rights! When has President Obama or any other progressive leader (such as Bernie Sanders or Hillary Clinton, and a whole slew of others) directly addressed the rainbow striped elephant in the living room that threatens to divide our nation along the bloodiest line: HOMOPHOBIA? The Orlando massacre was their golden opportunity to do just that, but instead, Obama focused on guns and not being Islamophobic…even when he knows that the perpetrator was raised by a fanatic Muslim who SUPPORTS THE TALIBAN, and who spoke VEHEMENTLY to his son about the evils of homosexuality, throughout his entire, short life. In fact, I believe that Obama has BETRAYED our community by downplaying homophobia, along with never confronting anti-gay bigotry in any of his speeches, including his State of the Union addresses. Especially in light of this tidal wave of anti-queer bills flooding the red states, and Republican lawmakers here and there, vociferating DEATH TO GAYS. 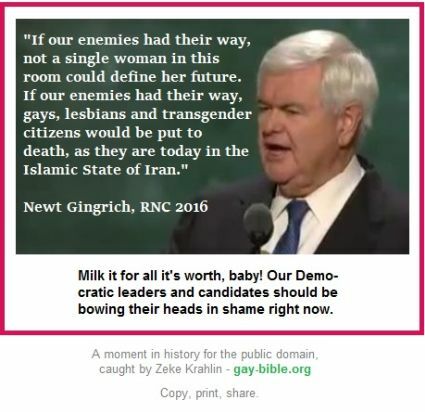 So now Newt Gingrich steps up to the podium and gives one of the most breathtaking–albeit brief–declarations in stolid support of sexual minorities, than any politician that came before. But I know it’s a deceptive play in this game of party rivalry. And Donald Trump’s selection of a rabidly homophobic vice president confirms my suspicion as clearly as the sun is bright. And THEY CAN GET AWAY WITH IT for two reasons: (1) the Dems have never addressed anti-gay bigotry, even when that is precisely what is so sorely needed these days, and (2) Islamic homophobia is far worse than that of the Christian brand. And that’s saying a lot, since Christians are directly responsible for inciting hatred, discrimination and violence against LGBT’s with especial vigor in recent years. THEY ARE HIDING BEHIND THE SKIRTS OF ISLAM in order to appear like cuddly puppy dogs to LGBT’s. AN OVERWHELMING RUSH TO THE GRAND OLD PARTY BY FORMERLY DYED-IN-THE-WOOL-DEMOCRAT SEXUAL MINORITIES. I’m sure the Log Cabin Republicans will cream in their Dockers over this. For unless she makes a sea change (and I hope she will), Hillary will do little to advance our struggle for equality, except for a baby step here, a baby step there. EVEN NOW, WHEN WE’RE UNDER PHENOMENAL ATTACK BY BOTH CHRISTIANITY AND ISLAM. There are some of us who believe, at this point, that a win for Trump will give us better odds than a win for Hillary. The reasoning is thus: should “The Donald” gain the highest office, he will be a lame duck throughout his entire term. In which case, LGBT’s can generate a greater force for change in our favor, than Hillary’s pro-disaster capitalism and war-hawk neoliberalism ever can. (And this will obviously be true for all other progressive causes.) The Republicans may even cater to our every whim in order to upstage their adversary, in hopes of making further inroads into their political aims. And maybe even morph into a party more liberal than Bernie Sanders, as they inadvertently fall into a bottomless well of progressive waters, in their blind scramble for power by seducing left-wing sirens! Oh what a tangled web we weave. No doubt about it: we are stuck between Iraq and a hard place (pun intended), for it looks like either vote is a roll of the devil’s dice. Hillary would be a very bad choice for president. As far as I see things, Clinton will espouse a good income base for the upper tiers of the so-called “99%” and make it look like her projects are also a great boon to the lower middle class, the poor and the destitute. Thus devastating (and even spelling the death of) close to 100 million citizens. My Social Security will be further cut back, and already-exorbitant expanded Medicaid fees will rise further on those who, like myself, can least afford it. 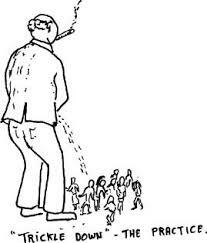 The extermination of the poor by gov’t shall be mostly invisible, silent and unseen by the higher classes who are convinced that the lowest levels are actually being provided quality health care, economic assistance, and a mended safety net. She will do little, or nothing at all, to address the rising wave of homophobia, as increasing numbers of Republicans and religious zealots (both Xian and Muslim) call for the death of sexual minorities. Other (non-gay) liberal organizations and folks will look the other way as queers get further marginalized, terrorized and denied even the most basic forms of medical care and legal protection. We LGBT’s may soon have our own Kristalnacht. Under Hillary’s reign, the Democratic Party will become stagnant, as left wing activists continue to be hobbled or imprisoned for blowing the whistle, and alternative energy programs will be shoved aside by fracking and nuclear power lobbyists. (Ms. Clinton is in the pocket of both Henry Kissinger and the Oil industry, may I remind you.) The GOP shall fight her every inch of the way, thus further destroying any programs that are progressive enough to restore our nation and this world into something sustainable and democratic. Am I willing to sacrifice my life as a poor person, that progressive folks and ideas from the wealthier classes survive, in order to save the world? Am I willing to sacrifice my life as a gay man, that the world may be salvaged, though only heteros hold power in this NWO? Am I willing to take it all down, rather than be sacrificed for a neoliberal/libertarian cause? Am I willing to foment the utter collapse of the upper and middle classes, since they have devastated the disenfranchised for their own perceived happy survival and security? Not that I even possess any sort of power or influence to participate in the takedown, except perhaps through my words scattershot across cyberspace.